1. The tongue is a very small part of the body but it can also cause the most trouble. 2. The evil that can come off the tongue is frightening. It can damage marriages, friendships, churches etc. 3. With our tongue we praise our heavenly Father and then also use it to hurt someone by the things we say. So our tongue is inconsistent. 4. Our tongue is untamable, it is like a caged animal just waiting for the right opportunity to break out. For me God has given me a sign when to keep my mouth shut. I get this burning sensation in my stomach going all the way to my mouth and I get this feeling of "Oh I can not wait till they are done talking to set them straight." That fire in my stomach is a sign for me to keep my mouth shut I am about to unload on someone or say something I am going to regret. Instead I pray about it. I do not always need to give my opinion or get upset. Yes it is very hard to do and I mess up a lot. But God knows that I am definitely a work in progress. So I am working very hard on this and trying to remember I can not put back in my mouth what has already come out of it. I hope you can take a few moments to read James 3. Today is my sweet Ryans 19th birthday. We won't get to see him on his special day because he is away at college. Him and his sister did come home for the weekend so we celebrated his birthday early. He wanted steak for his birthday so dad took us all to Texas Roadhouse. We don't go out much so this was a pretty special treat. We had to wait an 1 hour and 45 minutes to be seated. Wow!! It was so fun to be all together as a family again so we did not mind the wait to much. At Texas Roadhouse they have barrells of peanuts to munch on while you wait and you just throw the shells on the ground. Interesting huh? With both the kids away at school it feels being together as a whole family is rare. Here are a few pictures. Opening his card. We gave him money. What every college kid wants. His big sister adores him. Can you tell? So does his little sister. Ryan is my normal child. Haha. Love you girls!! As you can tell we had a great time. Thank you Lord for such a wonderful evening with the wonderful husband and children you gave me. What more could a girl ask for. Happy Birthday my sweet RyRy. So as I was looking at my blog today and I noticed I did not finish the last one I posted. What was I doing? I have no idea. I left my last post with my husband gave me this quiz the other day: What happen to the rest I wrote I have no idea. So I am going to finish it this time. Here is the quiz my husband gave me. I do not usually do these kind of things but for some reason he thought we should take it. I scored between a 31 and 40. I think it described me pretty accuatly. The only part I thought was off was the gifted part. I have been praying for what seems forever about what my gift is. You know some people you know, just meet or even see it in their blog and you know just what their gift is. Me, I have no clue. Hopefully I will figure it out. Sometimes I am a little slow. We went back to school today after 3 snow days off. Loved it. So I get in the class room with the other teacher around 7:30 and start getting everything ready for our day. Everything is set and ready and usually the kids come pouring in at 8:30 all ready and excited to get started. 8:30 comes and only one child and his mom come in so we are thinking well it is so cold and the roads are not great they are just running behind. But not the case all the moms we heard from told us their kids were sick so 1 child out of 10 came to school today. That is terrible we have never had this happen before. It was wonderful one on one time with the little one and great time talking to his mom and getting to know her better. But, I sure pray I do not get what all those little one have. Hopefully my saving grace will have been those 3 snow days off. Time will tell. 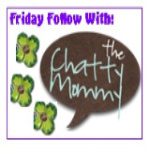 Lastly I decided to do a Friday Follow with the Chatty Mommy. She is a cutie. I hope you will take the time to stop by her blog. You will think she is a cutie also. We are on another snow day today. That makes 5 so far this winter. I am so enjoying my time at home. I have cleaned a bit, layed around a bit, read a bit, played Just Dance with my daughter. I am a terrible dancer. But it has been nice to be at home. We have been busy with Courtney and volleyball on the weekends. It is such a joy to watch her play volleyball just as it was to watch Alyssa dance and Ryan play football and basketball. I just love to watch the talents God has given to each of our kids. I would love to show pictures but all the pictures have other kids in them and I don't know that those parents want their kids face on a blog. So at her next tournament I will try to do a better job of just getting her. 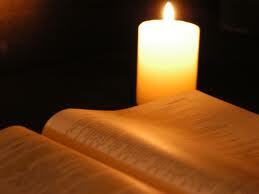 I am still really enjoying my devotion time with the study of James. I am leaning so much and getting to know the ladies in my group. So far I think James 22 is my favorite and a great reminder. Do not merely listen to the word, and so deceive yourselves. Do what it says. I know I am so guilty of that. I know what the Bible says but I don't always do what I am suppose to even when I have that feeling in my gut I should not be doing this, or watching this, or saying this. I hope you have a few minutes to spend in Gods word everyday. I know when my kids were little it was so hard. Sometimes I would lay down with them at nap time and while I tried to get them to sleep I would do my devotions. It was not a perfect situation but it was quite time with the Lord and I know it made God happy. 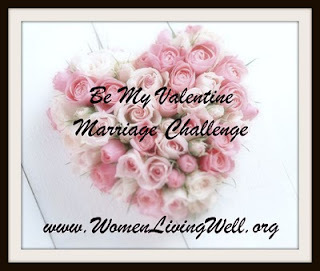 I am also participating in the Be My Valentine Marriage Challenge you can find it here. My sweet, hard working husband deserves the best so I am going to show him that. I feel as the kids were growing he was always put on the back burner. Not on purpose of course it just happens. He has never once complained or said a word about it. That tells you what a wonderful man he really is. So I am hopeing to have fun with this challege. My husband gave me this quize yesterday. I live in a small town in Kansas. Work at a wonderful preschool walking distance from our house. I am a wife to the most handsome, hardworking, wonderful father. We have been married for a short 22 years. A mother to 2 beautiful girls and 1 handsome boy. Our kids keep us pretty busy with all their activities but we would not have it any other way. I enjoy being at home with my family, baking, gardening and I love it when I find a good bargain. Thanks for stopping by.